That’s what my friend Susan’s husband calls it. And Matt was also the one to intervene into any future embarrassment so that I would correctly refer to the Canada Geese and not the Canadian Geese. Thank you Matt. What’s a California girl to know? 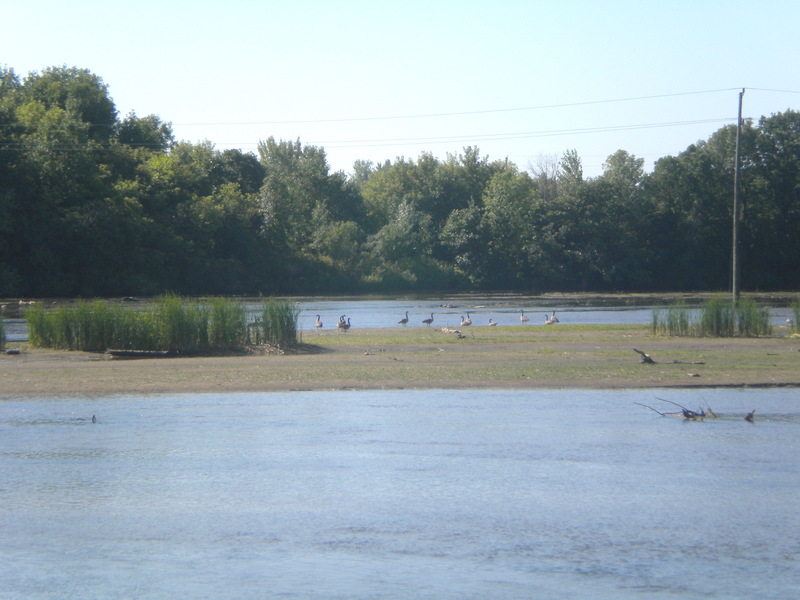 When we first arrived in Minnesota, to live across the street from the Otter Tail River, it was early June and the flocks had already made their long trek from the south. They beat us here and were already hatching little fluffy chicks who they then began to parade across the street and into the green spring grass. In fact, driving into town soon became a Make Way for Goslings experience. I always thought of Mom, the kindergarten teacher, whose favorite book to read to her charge-lings was Make Way for Ducklings. She would have loved it. Unlike many municipalities and golf courses, T.M. loves the geese. I’m not sure what old memory they evoke for him, but he professes a particular fondness for their immediate presence in our lives. But we are the snowbirdsredux who chose to return, if only to my roots, and chose to stay. They, on the other hand, will come and go, come and go – branta canadensis migrare. In the early summer they woke us up at dawn, and their cacophonous “ahonk’s” (gander) and “hink’s ” (goose) sometimes made me think I was back on Castenada with the wild turkeys squawking their way across our lower field. They’re honking all the time these days, and the sound is less a “Get-up, here I am, it’s dawn!” declaration, and more of a frenetic “get packing, hurry up, DID YOU HEAR ME!” They have a few weeks to go until the final departure date, but some early birds are not even waiting for the first frost to compel them into the skies and we see their take-off V’s throughout the day as they honk their way south onto the Mississippi flyway. The V is a powerful and thrilling sight. And the formation has a purpose beyond the esthetic beauty, as it seems that the “drafting effect” allows the flock to benefit (just like a cyclist in a race) from the currents created by their movement in the air. They CAN travel 1500 miles a day! And that means that it isn’t just Dad in the lead, for they have to take turns at the more exhausting driver’s seat. Yet here on the Otter Tail, many of the geese are still busily working out the logistics, thus the Group Honk as they evidently count noses and assign car seats and maybe argue over the inclusion of some distant unmarried uncle. For they do, indeed, mate for life, travel in relative family groupings, and will return together in the spring to the old familial stomping grounds. I can relate to that. T.M. is sad and says he’s going to miss them, but we are planted and redux, and they are wild and migrare. I’m hoping that Cousin Dennis who is down in Texas, will see them V-ing by on their way to, maybe, the Yucatan Penninsula. And although we missed the opening act this year, I suspect that the first early returns next spring will have us outside hollering out a great and welcoming GROUP HONK. This entry was posted in Birds, favorite things, minnesota life, MOVING, Wild Life. Bookmark the permalink.